The International Lasallian Advisory Research Group (ILARG) held its first gathering at Saint Mary’s University of Minnesota in Minneapolis on September 23, 2018. Members of Lasallian higher education institutions established ILARG to increase research collaboration among the institutions in response to Pope Francis’ encyclical letter Laudato Si’. During this gathering, ILARG members established three common areas for research on environmental sustainability: water, air and soil pollution measured by bioindicators; the healthy state of cities based on the principles of sustainability; and campus university transitions through sustainable development. The coordinators of these international research lines are Universidade La Salle (Brazil), La Salle Campus Barcelona URL (Spain), and Lewis University in Romeoville, Illinois, respectively. 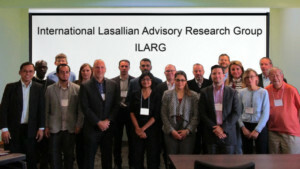 ILARG is a research network initiative established from the International Lasallian Institute for Sustainability of the Environment – Center for Urban Resilience and Environmental Sustainability (ILISE-CURES) at Manhattan College in Riverdale, New York. Representatives from each of the six higher education institutions in the United States were present at the meeting. The full participant list includes representatives from: UniLasalle (France); Universidade La Salle (Brazil); Universidad La Salle (Costa Rica); Universidad de La Salle (Colombia); Saint Mary’s University of Minnesota (USA); Christian Brothers University (USA); LASALLE College of the Arts (Singapore); Universidad La Salle (Mexico); Manhattan College (USA); Lewis University (USA); Universidad de La Salle Bajío (Mexico); La Salle Campus Barcelona URL (Spain); La Salle University (USA); De La Salle Lipa (Philippines); Saint Mary’s College of California (USA); University of St. La Salle (Philippines); International Lasallian Institute for Sustainability of the Environment, ILISE; Center for Urban Resilience and Environmental Sustainability, CURES (USA); and Lasallian Institute for Environment, LIFE (Philippines).